Take a sushi mat, set it on the counter or cutting board. Place a sheet of sushi nori on the mat with the rough, dull side facing up. Take 1 to 1 1/4 cups of cooked sushi rice and spread it evenly on the bottom half of the sheet of nori. Moisten a wooden spoon or rice paddle and press down firmly on the rice to evenly spread and cover half the sheet of nori. Place two Tbsp. natto in a straight line across the middle of the rice. 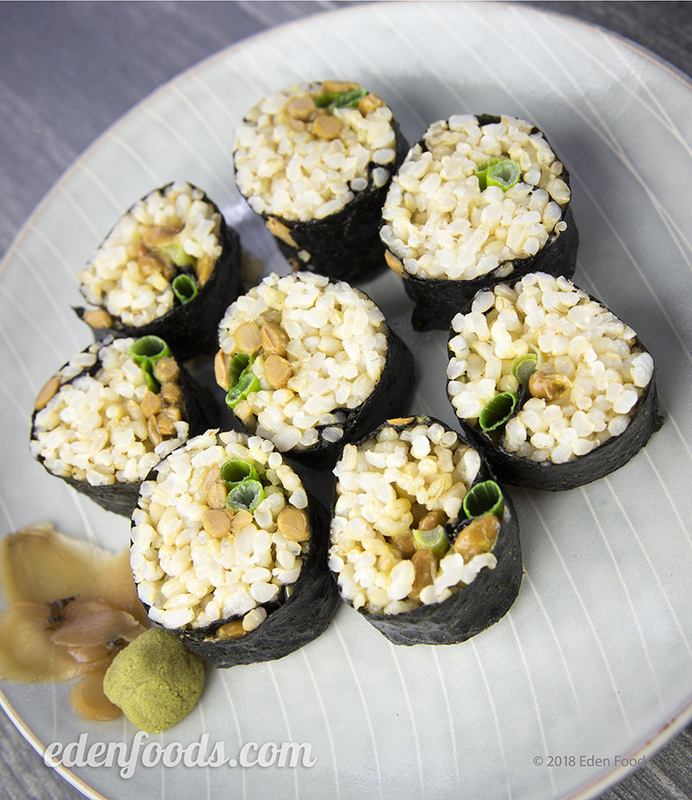 Place a whole scallion on top of the natto. Pull the mat up with your thumbs, hold and roll the end of the nori closest to you over the scallion and natto using all eight fingers. Roll forward in a jelly roll fashion, and tuck the nori forward, while pulling back the mat slightly each time you roll forward. Just before you reach the end of the sheet of nori, moisten the end with a little cold water. Continue rolling until you have a cylinder shaped roll. Tightly wrap the bamboo mat around the roll, and squeeze gently to seal the nori roll. Remove the mat and place the roll on the cutting board. Moisten a sharp knife with water and cut the roll in half. Cut each half in half, then each quarter in half, moistening the knife lightly each time before cutting. You should now have eight equal size pieces of sushi. Repeat the above steps until you have 2 rolls or 16 pieces of sushi.